Nearly a month ago I reached out to every wedding vendor I know to help support a friend who is battling cancer and planning her wedding and the amount of support we received was tremendous. Cherise is not only my best friend but she is also a kind, caring, warm and strong woman. Cherise and Erik were engaged at Disneyland on August 15th 2012 and they could not be happier, he popped the question right in front of Sleeping Beauties castle and after many tears of happiness she said YES! Only five months later she was rushed to the ER as she could not breathe and life as she knew it changed as she found out she had stage four non-hodgkins lymphoma. She began chemotherapy right away and ended up in the ICU after the chemo caused her lungs to collapse. She was put on a ventilator and chest tubes were inserted into each lung to drain fluid in order to keep her breathing. While in the ICU, her kidneys failed, which put her on dialysis for 6 weeks. She stayed on the ventilator for 3 weeks and in the ICU for 5 weeks. Her fiance Erik and her amazing mother and sisters stayed by her side through the whole thing. Because she was in the ICU and immobile for so long, she lost all muscle mass in her legs and developed neuropathy and myopathy. She had to learn how to walk again. For the past five years Cherise has also volunteered with Relay for Life and served on the events committee and over the years she and her family have helped raise at least half a million dollars, this past race Cherise was not an organizer but a participant. After 8 rounds of chemotherapy, she took some scans where they found some residual Lymphoma left, this meant the battle was not over. 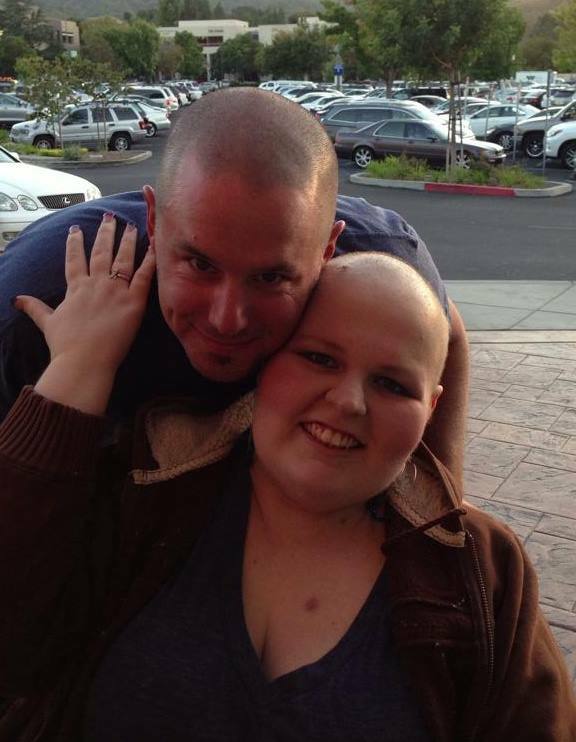 I flew back out to California to be by her side in the hospital as she underwent her second cycle of chemotherapy. Planning her wedding was the main source of joy and hope for Cherise and as a wedding planner and her best friend I wanted to make sure she had the wedding of her dreams! Having been in and out of the hospital and unable to work for more than a year her budget was very small but I did not want that to stop her from having the wedding of her dreams! In a matter of days Wedding Chicks posted about Cherise and her story on their Facebook page, Love Inc. posted her story on their website and my fabulous intern Alex also posted about Cherise on her Blog. Various wedding vendors across the country reached out to their friends and colleagues for support and the response has been incredible. So far Cherise and Erik have received shoes for her and her bridal party donated by Chromatic Gallerie, Photography donated by Coeur De La Photography, flowers donated by Loop Event Arts, the wedding cake donated by Fizz Bakery, Day of Coordination donated by Jonathan Templeton Events, Custom wedding coat hangers by Delovely Details, Bridal accessories by Hushed Commotion and a donation by a wonderful couple for a large amount of money to put towards their wedding. Cherise and Erik cannot express their gratitude enough for all of the kindness they have received. They had no idea that so many people they have never met would be moved by their story and help out in such amazing ways. I want to also THANK everyone who reached out and offered kind words, support and donations for the couples big day, you really have made a huge impact on them and their families. It just goes to show how many wonderful people are out there!